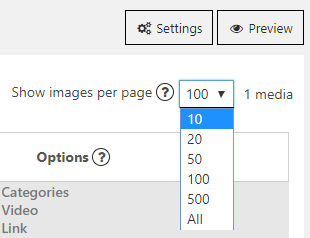 After you’ve created your first gallery and added the pictures to it, you can adjust photos properties with the help of Images List tab of the WP Gallery plugin by Supsystic. SEO – Add SEO keywords, separated by comma, or SEO-optimized sentences. They will appear under your image, when it opens in pop-up window. Copy to / Move to. Possibility to move and copy images to another galleries. Categories: If you want to arrange your gallery by categories, you should add category names here and separate them by commas. Video: Here you may add the video url. After clicking on the image thumbnail, video will open in pop-up window instead of the image. Link: You may add the link, which opens when clicking on your image thumbnail instead of pop-up window. Note: if you add video URL, this option will be inactive. Rotate: You may rotate image. Crop – In some gallery types image thumbnails are cropped. Here you may select the crop position to be sure that the most important part of the image will be visible. If you want to Sort the pictures you can do it with the help of below option. Just choose the required sorting option and click on it. Check article about Import Images here. Back to WordPress Gallery General . Back to main page of WordPress Photo Gallery plugin .